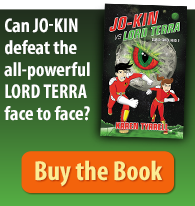 WIN a signed copy in the book giveaway! Meet my dear author friend Robin Adolphs who launched her gorgeous children’s picture book, Sylvia’s Itch about a sugar glider with a mysterious itch. Robin’s wildlife themed book is illustrated by super talented artist Aaron Pocock and designed by the highly esteemed Book Cover Cafe. Robin and I met at Year of the Edit writing course at Queensland Writers Centre. We share much in common: we’re both teachers, writers and my resilience picture book Bailey Beats the Blah was illustrated by Aaron Pocock and designed by Book Cover Café too. YES, we share the same publishing team! On 28 February, the Wildlife Preservation Society of QLD launched Sylvia’s Itch at The Centre, Beaudesert part of a wildlife awareness day. Sylvia is a beautiful young sugar glider. She should be happy, but she has a problem. She has an itch that just won’t go away. Even worse, it’s right in the middle of her back in a spot she can’t reach. Sylvia and her best friend Penelope just can’t get to the bottom of Sylvia’s mysterious itch, so they set out together to find a cure. Sylvia’s Itch is an endearing story of friendship, tenacity and problem solving. Leave a comment below explaining why you’d like to win a signed printed copy in the book giveaway. 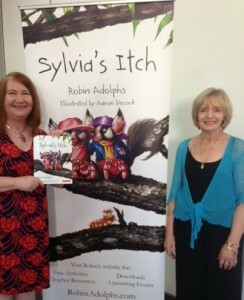 Sylvia’s Itch looks like a great kid’s book to read. 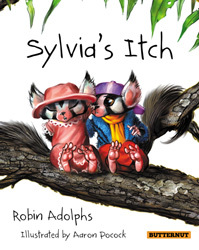 I believe kids will absolutely love the story of Sylvia and her buddy trying to find a cure for this mysterious itch, and they’ll probably want to read ‘Sylvia’s Itch’ over and over again. The pictures look adorable too! Thanks so much for being the first to comment on Sylvia’s Itch. Thanks Steve for leaving a comment of support. Wildlife, gorgeous illustrations, delightful characters and there is a story I need to read. Congratulations, Robin and Aaron. 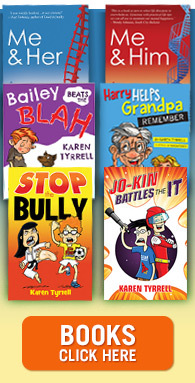 Thanks Karen for the wonderful support and for telling the world about Sylvia, Penelope, Annabelle and one other character . . . who will remain nameless! Thanks to everyone for the positive and kind comments too. I loved writing this story. Enjoy! 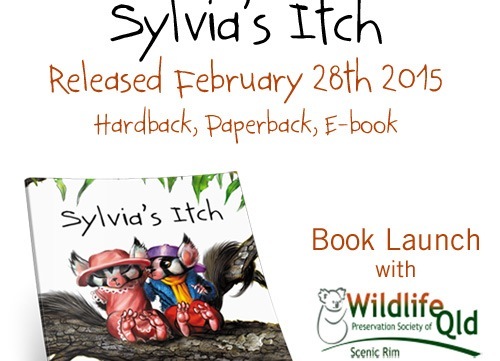 Sylvia’s itch looks interesting and educational, a children’s book that I might be able to read for my story time. It would teach children the importance of friendship and caring, as well as looking after each other. This theme of ‘Australiana Animals’ reminded me of other Australiana picture books by authors – Jackie French and Mem Fox. Love the illustrations too. I would like to read it asap. I would love to have this on the shelf of my school library! I love the idea of this story. 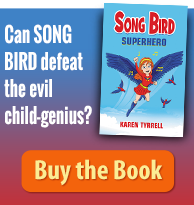 So often quirky things like an unexplained itch happen to children and so I think they will enjoy reading about Sylvia – the illustrations look stunning too – always a draw card for young children. My name is Penelope and I would love to have a sugar glider as a friend. They are so cute! PS You sound like a teacher Like me. This book sounds such fun. It’s the kind of book I’d like to have written myself. What a clever story idea, Robin. i would love to share this problem solving story with my year 3 and 4 children. As well as show the young children the beautiful pictures. Would love to read this to my students. I think teamwork and friendship is such a wonderful lesson to teach.